Been on an eventful rideout today with NUKB led by DocB. 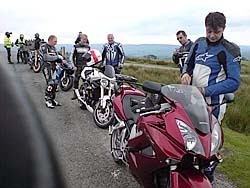 We started out by going through the Trough of Bowland, not sure some of the guys expected it to be so twisty and bumpy. We then made our way to Devil’s Bridge for a brew and unfortunately Wolfrunner dropped his bike in the car park. 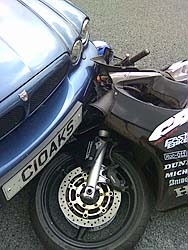 We quickly got his bike up and apart from a bruised leg he was fine and continued on the rideout with us. We met up with BigFatBloke from the NE arm of NUKB at Devil’s Bridge and then proceeded through Sedbergh on our way to Hawes. After being stuck at the back for a while in the twisties I eventually decide to go off the front to catch up the other guys. I took a slight right hander under the viaduct and the back twitched, oh great look at this crap that has been laid on the road. The road surfaces around this part of the Dales have recently been re-surfaced with what can only be described as gravel. As I went a but further I noticed some people in the road flagging me down and then noticed a biker in the middle of the road and a bike stuffed into the front of a parked Jag. I pulled over and found it was Lee’s CBR in the road, after a brief while we ascertained that Lee was OK and got him to his feet and sat him down. 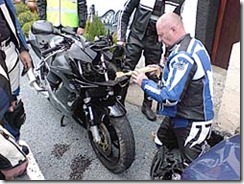 Then proceeded to remove his bike from the Jag. 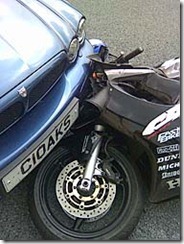 After the Ambulance and Police had left we fixed Lee's bike up as best as we could and he bravely rode it home. UPDATE - Lee's bike is now fixed and back on the road.